In the world of TV, shows are said to have "jumped the shark" when they're past their best. But, in music, there's no similar term for an artist who goes from pop star to flop star. 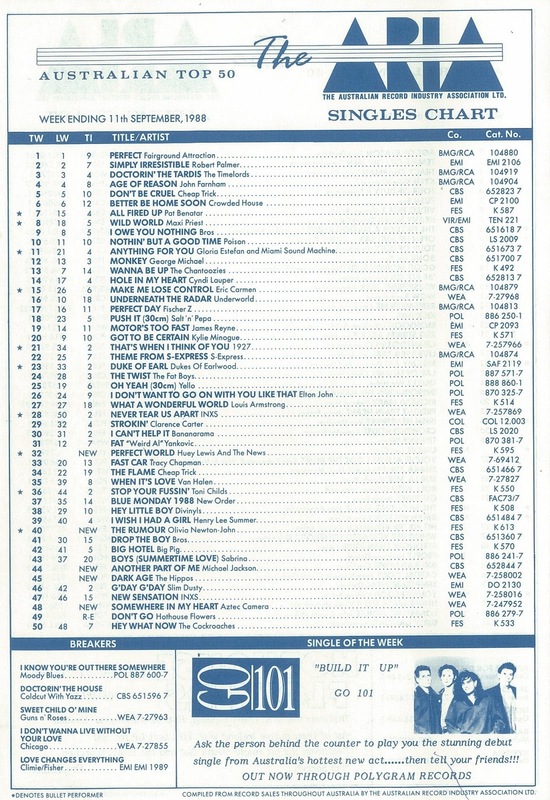 This week in 1988, an artist who'd ruled the charts at the start of the decade, struggled with her first single from a new album, while possibly the biggest music act in the world barely made an impression on the top 50 with his latest single. For one singer, it was more of a problem than for the other. There were no such problems facing Fairground Attraction this week in 1988, with "Perfect" still sitting at number 1. But, it wouldn't be very long at all before they, too, passed their used by date. "Under The Milky Way" had given them their biggest hit in years, but this more upbeat second single from Starfish wasn't able to capitalise on that momentum. In the US, it became the first of his three number 1 hits, but this power ballad didn't follow "Should've Known Better" and "Endless Summer Nights" into the top 50. Like Simply Red and Jamiroquai, Aztec Camera is a band that essentially revolved around its frontman, Roddy Frame, with all other members kept in the background (and regularly replaced). This was the Scottish act's biggest hit (a number 3 smash in the UK), and it's one of my favourite songs from 1988, which makes its lowly Australian chart position somewhat of a disappointment. Always guaranteed to put a smile on my face, no matter how many times I've listened to it before. Not to be confused with an identically named American band from the '90s, The Hippos were one of those obscure Australian pub bands that never quite broke through to major success. I don't really recall listening to the song at the time - and, if I'm honest, I didn't make it through the entire YouTube clip below, but here it is, for posterity's sake. Bad had confirmed his status as one of the world's top recording artists, but this latest single (the sixth) from the album didn't get any further than this debut position. Still, for a sixth single from an album to get anywhere near the top 50 in the first place was impressive enough. For me, there were much better songs that could have been released before "Another Part Of Me", such as the duet with Stevie Wonder, "Just Good Friends". More singles would come, since Michael wasn't done mining Bad for potential hits yet - not by a long shot. In fact, "Just Good Friends" would end up as one of only two song not released as a single. The other: "Speed Demon". There was no bigger pop star in the first two years of the '80s than ONJ. Off the back of her megastar-making turn in Grease, Australia's sweetheart released a string of worldwide hit singles, none bigger than 1981's "Physical". In a pre-Madonna world, "Physical" was deemed controversial, but it's probably no coincidence that Livvy's "shark-jumping" moment came in 1985, when Madonna redefined what it took to shock the world. 1985's "Soul Kiss", the title track of ONJ's first studio album since Physical, was moderately successful, but not the type of hit she'd become accustomed to - and nothing else from that album fared any better. Three years later, she enlisted the help of Elton John and his regular co-writer, Bernie Taupin, for her next album's title track. The result was even more disappointing - from a chart perspective, that is, since I think "The Rumour" is a much better song than "Soul Kiss", but by 1988, Olivia's time had definitely passed. Here's another act who would have some difficulty living up to a massive album - although for Huey and pals, their efforts didn't go as unappreciated as Olivia's. "Perfect World" was the lead single from Small World, the follow-up to Fore!, an album so associated with the '80s it featured prominently in Bret Easton Ellis' American Psycho. Released in 1986, Fore! had yielded a string of hit singles (and included 1985 soundtrack hit "The Power Of Love" for good measure). Two years later, "Perfect World" was another US top 5 hit for the band and performed reasonably well in Australia, but Small World sold a fraction of what Fore! had, and subsequent hits were hard to come by. Next week: anything Farnsey could do, another Aussie music legend thought he could do, too. Plus, the arrival of one of the biggest rock acts of the late '80s and early '90s, and my favourite single of the entire decade. To my surprise, I actually like that Church song... a bit. 'Somewhere In My Heart' should have done much better on the chart. I love the enthusiastic backing singers in the video. 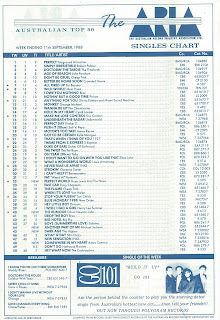 The Hippos song dented the lower region of the top 40 on Take 40 Australia, who were using their own chart (based on what, I don't know) in 1988, so I heard it a few times then. I think it also got some airplay on Melbourne FM stations. By 1988, Olivia seemed, to me anyway, as more 'New Idea' fodder than a charting pop star. I remember thinking it slightly interesting that Huey Lewis & The News released two consecutive singles that were '(adjective) World'. But they're both pretty much forgotten now, unlike earlier hits.